The FUS control workstation is the brain of the system. 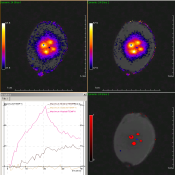 It is build on the Thermoguide software for treatment monitoring with an additional module for treatment planing and targeting. Its design enables the clinician to efficiently perform the four steps procedure with an easy learning curve. Targeting is the most important step for patient security. The transducer is automatically brought in a position with an adequate acoustic path to the tumor. 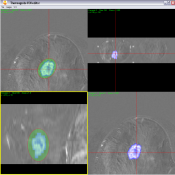 The positioning accuracy is then tested with a low power shot that is detected on MR images. This test ensure correct trajectory for the focal spot regardless of the acoustic propagation properties between the transducer and the target. 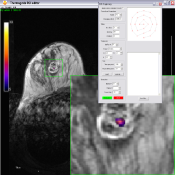 During the procedure, temperature and thermal dose maps extracted from MR images are displayed in real time overlaid on anatomical images. Real time temperature imaging enables corrective control of the treatment by adapting the spatial distribution of energy depending on the actually measured temperature.